The No. 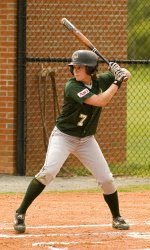 2 seed Charlotte 49ers open play in the 2009 Atlantic 10 softball tournament at 3 p.m. Thursday against Saint Louis at Fordham's Bahoshy Field. Saint Louis (22-31) advanced out of the opening round with a 10-0 victory over Saint Bonaventure on Wednesday in six innings. Charlotte (32-14) and Saint Louis split their doubleheader earlier in the season. The winner advances to take on the winner of Thursday's 1 p.m. game between top seed Massachusetts and Fordham. The loser of the Charlotte/Saint Louis game will move to the loser’s bracket of the double-elimination tournament. What are the 49ers chances of going all the way? Why does the Observer write about UNCC girls sports but not about the 49ers baseball win over UNC? The only time I see anything about 49er baseball is when they lose but they've won two thirds of their games this year. It seems the 49er beat writer is a bigger fan of women's athletics than he is men's sports. You can't carry UNC's bats you wannabees.